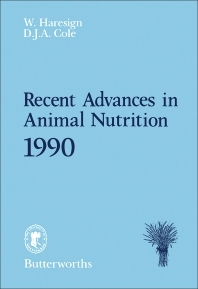 Recent Advances in Animal Nutrition 1990 focuses on technologies and controls needed to ensure meat quality. The book first discusses allergic responses to diets in humans. Changes in meat consumption and consumer attitudes; improving the quality of meat; and implications for the future are described. The text looks at legislation and its effect on the feed compounder, including marketing of feeds, medicated feeds, bovine spongiform encephalopathy (BSE), and safety regulations. The book also underscores the control of feed-born bacterial and viral pathogens in farm animals. Animal infections and diseases connected with feeds; control measures during manufacture of feeds; and public health implications are noted. The text also discusses chemical probiosis, effects of mycotoxins on animal performance, and nutritive value of wheat and its effect on broiler performance. The book then focuses on water requirement of growing-finishing pigs. Water input/output relationships in pigs; factors affecting the relative contribution of different water losses/uses; and factors affecting the supply of water to pigs are described. The text also discusses water requirement of poultry, piglets, and lactating cows. The book is a valuable source of data for readers interested in studying the controls and technologies needed to improve meat quality.